Architectural historian, Mosette Broderick speaks about how preservation evolved over the course of her career and the historic significance of several landmarks sites. Above: Leonard W. Jerome Mansion, 32 East Twenty-sixth Street, New York County, NY, 1877-1878, Courtesy of the New York Historical Society and the Library of Congress Prints and Photographs Division. Mosette Broderick’s interest in preservation was spurred by the efforts to save the Villard Houses. She worked as an assistant for the architectural historian and champion of preservation Henry-Russell Hitchcock for many years. An architectural historian herself, Broderick frequently provided expert opinions to the New York City Landmarks Preservation Commission on behalf of landmark designation proposals. She speaks about her work with as a historian and the evolution of New York’s preservation movement over her career, including the renovation of the Villard Houses, the battle to preserve St. Bartholomew’s Episcopal Church, the Schinasi Mansion, and designation of the Coogan Building, which was eventually demolished. Broderick also comments on the evolution of the role of architectural historians in the preservation movement. Q: This is Megan Ricks interviewing Mosette Broderick for the NYPAP [New York Preservation Archive Project] project. Mosette, thank you for meeting with me today. Broderick: Thank you for agreeing to do so. I’m flattered. Q: I guess my first question is could you tell me a little bit about your background and your education and sort of how you ended up where you are today. Broderick: I don’t know where I am today. But, I started out studying art history and became interested in architectural history in the late 1960s. At that point, girls weren’t supposed to like architectural history and weren’t supposed to practice in it because it was a men only field. And if you look through the history you’ll see most everybody is men. There are exceptions but most everybody was. The other caveat of what you were not supposed to do was be interested in preservation. Architectural historians were thought to be above the level of the fray of saving buildings and I never heard a word about that phenomenon when I was in graduate school and when I first started to become interested in actually saving buildings, I met with a lot of derision rather like the derision I met with when I wanted to do architectural history. Initially, I studied English architecture for a long period of time, until the economics of English architecture or the exchange rates and America’s problems made that too costly. So, I switched to American architecture and that brought me closer to the preservation world. The first thing I remember, the first preservation battle I personally remember—well, actually, I do slightly remember the destruction of the Brokaw House as a naïve high school student who came to New York on occasion. There was a mansion on the corner of Seventy-Ninth [Street] and Fifth [Avenue], a big chateau, that belonged to a curious family of the late Nineteenth Century called Brokaw, B-R-O-K-A-W. I guess it was, and that was threatened and demolished in the mid-1960s I would guess just—Tony [phonetic] would know this better than I—just before the law became active. That’s the first thing I remember. I do remember people actually saying they would go with bulldozers and stand in front of them, but it was just sort of a vague—I was in boarding school I didn’t know anything about this. But, later on the first active cause—and the [New York City] Landmark [Preservation] Commission now did exist and it was, in my opinion, afraid to do too much. But, the first major issue was led by the indefinable long alive Margot Gayle who was behind many of these issues and worked tirelessly if she cared. Margot never worked for anybody else’s causes. She wanted everybody to work for hers but she never shared back. But the first cause I remember—I think she had already done Jefferson Market [Courthouse]—the first thing I remember was Grace Church schools, which were on the backside, the east side of Grace Church, and I remember going to city hall to the Landmark Commission meeting and watching that all unveil. In the end, Margot Gayle and the preservation community prevailed and that building was saved, all those buildings were saved, and I think it had become a major factor on that part of Third Avenue, which is a banal—there are a lot of banal buildings and it’s a great asset to have there. The next thing that I remember I think was the Villard Houses, which again I came in too late. The buildings had been saved, they were landmarks, but they were being raided nightly by kids who would go in and rip off the metal door handles and the scrap metal that they would take and sell, and so the buildings were being pretty badly eviscerated. This was in negotiations with the [Harry B.] Helmsley team to decide what parts of the interior should be saved and which parts should not. In the end, because of these thieves, more of it—they rushed to an early judgment and more of it I think could have been saved then it was. I remember again as active in that Brendan Gill, who was very interested in social issues, he was very interested if it was high society, and he was involved in that. I remember Philip Johnson who was active in preservation surprisingly way back in Penn [Pennsylvania] Station but who came forward and made one of those awful comments that he always made, which was really dreadful and disheartening and exactly on target. He said that given the allowance they were making to demolish four of the houses that it would have been better to let them all go. Now, I don’t agree with that. The saving of those buildings was wonderful but the way the new building was tacked onto it, etc., was pretty awful. So, I still remember Johnson’s comment, he was often ahead of the game. How he could let everything on Fifth Avenue, as you all know was a mansion laden avenue all the way up until the Nineties [Streets] and they were all demolished in the ’20s and to have one building that was a corollary and one of the maybe half dozen mansion buildings on Madison Avenue, but the other one left of Fifth and Madison, to have it so totally decimated by the bad taste of Mrs. [Leona Roberts] Helmsley—not only grafting that black slab on the back of the building, but in destroying so many of the rooms that should have been left. They should have built the building farther back so that the interiors could have been saved. One of the interiors where they broke away from the pattern of the usual interiors in the Villard houses was sent to the Brooklyn Museum, but of course, they had no money, no one has ever seen it, whether they’ve ever put it up or not I don’t know. About that time, about 1980, when the Villard Houses were opening as the [Lotte New York] Palace Hotel on the birth date of the Leona, which I will always remember, September 1, 1980, a date that was noted by many newscasters, she finished the building up fast to have it ready by her birthday and despite the fact that the panels on the façade of the hotel were black by mistake she wouldn’t wait for brown ones to appear to go with the brown stone of the building, she came up with some stupid line, or her public relations people did, that the building was so dirty she didn’t know it was brown then, and who in the world didn’t know that, and so she stuck with the black panels just to have it finished on time. The newspaper reporters had a wonderful time. She modestly called the place the New York Palace Hotel and every reporter on the block looked up in the phonebook and found that there was already a New York Palace Hotel. It was down in the Bowery and it was a place where the television was chained to a table in the lobby and so the reporters had a lot of fun making comparisons between the overdone nature of Mrs. Helmsley’s high-Las Vegas or high-Miami style hotel with the earlier Bowery Palace Hotel. By that point—by 1980—more architectural historians were agreeing to be involved in preservation. The only eminent figure who did it—there were a lot of these kinds of figures who floated through and who began as preservationist like Margot Gayle after a public relations career or gad flies like Brendan Gill—the only serious person who did a little bit of it and did come to testify for I think even Grace Church, was Henry-Russell Hitchcock, the eminent architectural historian and I think the dean of the profession, the greatest figure of the Twentieth Century. He was interested—he knew Margot Gayle from the 1960s and Brendan Gill from the 1960s because they had formed the American branch of the new and highly motivated Victorian Society in the U.K. [United Kingdom] and the three of them, Hitchcock, Gayle and Gill, formed the Victorian Society of America in Margot Gayle’s then Ninth Street apartment in the kitchen. Hitchcock always told me, where they could see the Jefferson Market Tower. That’s what got Mrs. Gayle to restore the clock, which was the factor that caused the neighborhood to care enough to save that building. Hitchcock did—although he wasn’t tireless—he did sign on and he told me many times that architectural historians where not thought to properly do this but he did it, he spoke for Grace Church and I remember him speaking for the Villard Houses. He became interested in these causes. Like I guess when you’re used to a building and you see it go down and you think it has architectural merit even if you’re supposed to only be an academic historian, you do wish that building to continue and he did. I can’t think of anybody else from their exceptional community who did that in the academic faculty level. The—I’m just trying think—the other figures of the day were George Collins, who was not always well balanced, Vincent [J.] Scully [Jr.], a lot of peripatetic figures and a generation younger than Hitchcock but they did not actually act in the field. The other person who acted in the field and again broke the norm was Sarah Landau, who was just beginning her career or again at NYU [New York University] teaching architectural history. But she—I remember her involved in the Grace Church and many, many other causes, which we’ll talk about until this day. She actually got out there and did it despite the—what’s the word—probably animosity, probably behind everybody’s back, the architectural community was probably dishing people who were doing this because it was too jaded and too much of a real world. In England, the comparable people do, do preservation battles, people of that level of academic skills, they always have, they were involved in it. And interestingly enough although it’s a mixed comment but no architectural historian, other than Andrew Alpern, Rosemarie [H.] Bletter once, ever worked for the other side to work for a developer. In England, people did it. They would be bought by a developer sometimes and eminent people. The most shameful case was Sir John [N.] Summerson, the lifetime curator of the [Sir John] Soane’s Museum, and a wonderful architectural historian and the giver of many major lectures. I remember he was Mathews [phonetic] lectures, when the Mathews lectures still existed here before Columbia [University] killed them, a very important annual event for architecture at the Metropolitan Museum [of Art] even though it was administered by Columbia, he was a lecturer here and generally he was a good man. He went around to demolish buildings in the 1930s and took pictures in the U.K. during the war, when buildings were bombed during the war, particularly churches. He and his triplet children—I think it was triplet sons, which was one set of children but they were triplet boys who must still be alive—they photographed for record, and it’s in many of these photographs through the national monument record, badly damaged buildings, many of which later were of course torn down after the war. Summerson, in a very ugly case, of the late 1970s, early 1980s, which really was perhaps the most blood laden of all the cases of preservation in the U.K. over something called Mansion House Square and the Palumbo family property, a set of second tier Victorian buildings, which Hitchcock had written about in his early Victorian architecture book. They were not the Taj Mahal, they were not first-rate but they were good second-rate buildings. The elder Palumbo in the 1960s had a design that he had contracted for commission by [Ludwig] Mies Van Der Rohe, rather in the Lever brothers—or sorry, the Seagram Building’s style, and it didn’t get built. It was trotted out again twenty years after the design had been made at a point where both the elder Palumbo and Mies were very dead, and brought forward for a big slab building at this curved site at the heart of the business district of the city of London where the Mansion house sits, where the stock exchange sits, not very far away where there were many other contributing second tier Victorian buildings. The younger Palumbo, Peter [G.] Palumbo, wanted to do the nice building again, he was disallowed. In the end, he was allowed to build another building, which he claimed would be—oh, sorry, preservation battle. There was a very long and very deep preservation battle and in it Peter Palumbo had flown John Summerson—it doesn’t sound the kind of thing he would do—but he had been flown to Chicago where he went to the Plano House, the Farnsworth House in Plano, and had had a weekend in this house, which was owned by Peter Palumbo at that point, free and he was flown back and it was a monument of modern architecture and it was enough of a bribe that Summerson probably torn, but Summerson testified for the demolition of the Victorian buildings. In the end, a very second-rate building was built on that site, which looks worse every year. The story is sad. We really have not had a defection like Summerson. No architectural historian in a major way has been dragged onto the other side of preservation. They usually worked free and gratis for the preservation groups, although now that preservation has become a profession, sometimes the preservationists who are paid of course to create documentation and testimony for cases as they come before the Landmark Commission but no one has gone the other way. I don’t know about the preservationists, if they’ve gone the other way, but no architectural historian has, and I think that is a major compliment to people to have not done that. I’m just trying to think what happens after that. What were the major battles? There was the preservation train issue when Grand Central Station still had to go to the [United States] Supreme Court level in that seminal case that decided fortunately in favor of the taking provision of Landmark Law. And I do remember that, it was organized by the MAS [Municipal Art Society]. That was one of the Municipal Art Society’s high points. The Municipal Art Society, as you all know, began in the 1890s and had its ups and down. It went up and down and up and down and it became I gather—it was important in the late Nineteenth Century, or maybe early Twentieth in the City Beautiful era, it was forgotten about for a long period of time. In the 1950s, I think they did walking tours and had a lot of gentlemen, single gentlemen, who maintained an interest, thank god, in New York City’s history, but it didn’t have an active role. The active role coincided with the Villard story when they were able to get those quarters virtually free, which they now had to give up, in the Villard houses about 1979, 1980 and at that point, the Municipal Art Society very briefly had a flourishing role in the city again. They had a mandate in the newspaper called The Livable City [phonetic], and they took up preservation, and they took up causes and they were active and people cared about joining in and being part of it, and they functioned with testimony that mattered. In fact, they actually secretly probably set up most of these local preservation groups, and they had a role in the Villard houses, they had a role in preservation for a while. They certainly organized this protest or this public relation’s effort to uphold the law in front of the Supreme Court and the issue of churches. They then got themselves in trouble with the Donald [J.] Trump issue in first Boston over that building behind the Coty perfume company, windows that were all these glass, and it looks as if there was double-dealing. You could never get the Municipal Art Society off the Upper East Side or out of the realm of Jackie [Jacqueline] Kennedy [Onassis] and people dropped out of the Municipal Art Society and nobody cared about them any more and that’s kind of been their sad legacy, we certainly need them. They did organize this train, which I do remember. People took the train. It was a big deal at Grand Central Station. They used at that point a phenomenon that the directors of the community board’s landmark’s groups always referred to as shiny people. I thought the expression was so funny, shiny people. By that, they meant celebrities. And in the 1980s, celebrities had to be part of the picture to keep the board bureaucrats alive and willing to do their job and to get public relations. In this train to Washington, D.C., Kent Barwick organized it with the love of his life, surely, Mrs. Onassis, who they used as an inflatable doll—it was actually very pathetic, I saw it happen twice. They used her as an object as if she was a blown up figure and every time a newspaper reporter would come in, grab her by her arms and shove her forward into the cameras. They took off for Washington in that public relations trip did its job and the law was upheld. There was an issue later, about a decade later, towards the end of Mrs. Onassis’ life indeed, when the churches and the preservation community within New York State faced opposition from the legislature in Albany and people again got on a train. I remember that, it was organized by Kent Barwick, and I think executed at that point by Tony [Anthony C.] Wood, who was a great guy in this field, and again they used Mrs. Onassis, using her again like a doll, it was very weird. When we got to Albany she gave the first speech. There, I would say about seventy-five people from the preservation community in New York on that train and we couldn’t even get into the room because the local—and that was fine—the local bureaucrats were so eager to see Mrs. Onassis that they filled the room for her testimony and we discreetly stood outside until they finished, until she finished, and then they sent her back to New York by jet and everybody else sat inside and did testimony. I thought this was going to be a real bomb, because how could seventy-five preservation people have any talk that isn’t the same talk over and over again and they’re going to get bored and they’re going to go against us. To my amazement—I will not forget this—everybody had a, totally uncoordinated, but everybody had a different tick and it was an excellent day and an excellent session and it worked very well. Losing Mrs. Onassis and then some of the other shiny people, I don’t think there are any celebrities now connected to preservation. I remember Carroll O’Connor, who was Archie Bunker, came forward on some issue; I’m just trying to think what that was. There were often stars through the ’80s but hopefully we don’t need them any more. I don’t see why celebrities would matter anyway, but in any case, that was the era of the celebrity as the factor in making the Landmark Commission work. I’ve gone on too long. Q: No, not at all. Going back a little bit to your work with Henry-Russell Hitchcock, you started out working for him in the ’70s? Broderick: I did. Maybe it was—let me just try to think. Yes, it must have been the ’70s or it was the late 1960s. Henry-Russell Hitchcock was a remarkable man, a truly wonderful man, who had a little bit of an ego but understood causes and understood the importance of caring about buildings. He had total recall. He didn’t pollute his visual sense by watching movies or watching television and as a result, he could literally walk you through the Arts Decoratif Exhibition of 1925, booth by booth, display by display, he remembered every bit of it. He could just visualize in his head every building, every restaurant, every bar, he knew exactly where it was and he had a truly amazing—I remember I met him because he had retired from Smith College about 1968. He’d not been allowed because he broke two caveats of architectural history, alcohol and homosexuality, he’d not been allowed really to have much contact with graduate students and that’s why we lost a generation. I think that’s probably why our field is as small as it is because he wasn’t allowed to teach people who have gone into the field and become the mentors to the next generation, so we lost a generation because of it. But, at his retirement from Smith in 1968, he came to the Institute of Fine Arts, [New York University], which was a great compliment and a great delight for him. He was very happy because he had been shunned in graduate school and he had the opportunity and he was therefore actively teaching there about fifteen years, which was really quite wonderful he taught seminars, although he did do the odd elective course. I guess you’re right, it’s the ’70s. During that time period, I took two seminars with him and it took a long while to break through the fog of his defense system and often rather unattractive females like me never made it through. But towards the end, I would see him occasionally having a sandwich at a restaurant on Seventy-Eighth Street and Madison Avenue, now long gone, called Stark’s and we began to talk and finally I broke through into the zone. Once you broke through that zone, you would never get forgotten. And he looked at me and he said, “Can you type?” And I said, no, I couldn’t do it. Part of my education [unclear] that ladies of a certain economic background were not supposed to type, they either would become wives or have secretaries, was what they told me. It was a very, very large handicap to my life, not being able to type. But he looked very pleased and he said, “Fine. You’ll come over this week.” He didn’t like people who could type because people who could type flew through the manuscripts and made mistakes. People who couldn’t type labored intensively and never made a mistake. So, I worked for him from the 1970s through his death in 1987, just about now, this time of the year. He was a wonderful man to work for. That’s part of where I heard some of these preservation stories, that’s part of how I knew about the Mansion Square issue because he was contacted on that. What is it? I remember one person, Ludwig Glaeser, got involved in that on the wrong side now dead. The father of the very good economic historian at Harvard, Edward Glaeser, but that’s beside the point. I worked for him and did a lot of research, typed manuscripts, went over and generally discussed things with him in what became an increasingly close relationship as he got older and couldn’t do favors for people the way he was active in the field, people stopped calling on him, people stopped visiting him. He was a very gregarious person and he became lonely so I used to stay there for day after day after day, often for dinner. He could cook surprisingly, very well. He was a very good cook. When arthritis got his ankle and it was harder for him to cook, his companion, Mr. Robert Schmitt, began to cook and so I would stay and we would talk and it was a wonderful experience, a remarkable time period. And it went on about twenty—was it twenty years? Not quite, fifteen, eighteen years. He retained his interest in the all the fields he ever was most interested in even though he worked rather Merlin-like, going backward into earlier and earlier time periods, starting with or returning to the Romanesque, that’s what he was thinking about when he died, he retained his interest in the periods he had left behind. So, we always had something to talk about with Victorian architecture, which I was interested in then. I remember when architects would come and visit him he would keep up—he always kept up with contemporary profession as well. He was truly a remarkable man and he did have the—what’s the word—the bravery to go onto landmark causes with increasing interest by the 1980s in his last decade. Q: So, how did architectural historians like yourself and Mr. Hitchcock how did you role in preservation evolve? Broderick: Well, as testifiers on the preservation issue, what we would do, the way it began, I suspect was more haphazard then the way it is now. Initially, there would be a cause, you needed to have a leader, that’s very important, then you needed the shiny people to come down to start the hearing and then you would have testifiers—usually it would go half hour each side at the Landmark Commission, and you would have people who were historians speak, as well as lay people. So initially we all came in to give testimony and to write letters and then there would be a half hour with the interests of the organization that was involved in trying to demolish and it would go back and forth in that way. This later evolved to the way you all know it where you now seemingly hire a consultant and he writes a report for the landmark advocacy groups and it moves from there. I think that’s a fairly new refinement of the last two decades. But it was usually you just go in and you’d speak from the historical platform, so to speak, of why this was—it didn’t carry any more weight and certainly didn’t carry the weight of a shiny person and certainly was nowhere near up to Carroll O’Connor or whoever it was, but you would just give your testimony and sit down and hopefully stick around a little bit to show some support for the preservation community and that was it. Q: So, how did the role of the community, sort of the groundswell, do you think that had—and particularly in the ’70s and the ’80s, did that have a large effect on how the proceedings would go with the landmark’s community and with the groups that were organizing? Broderick: The depressing feature for me for the groups other than the—there are some wonderful groups, there are some wonderful people who go cross issues, but rather like Margot Gayle, but even less willing to take on newer causes. Margot Gayle at least took on several causes, most of the early groundswell operations were done by neighbors’ reviews and they tended not to go help out other neighbors. I remember many times going in, agreeing to do the freebies for them—I would say that again the architectural historians never took a nickel from anybody—but going in and agreeing to do it and going to their meetings and helping them and I would always say to them, “Just help the next cause. You do a little volunteering for the next cause.” And it never happened. So, usually it was people with a view or I guess these issues started with—here’s a curious feature—they started with buildings that were so big and so important that everybody, including the architects of the day who weren’t interested in old buildings, this was the height of modernism so they weren’t interested in older architecture, but they got on board and that would be Penn [Pennsylvania] Station and that would be the Villard Houses. Sadly, there are a couple of major buildings that go down in the middle of this where there wasn’t a local group or the local group didn’t get—and maybe because there were no views. The Metropolitan Opera House, the old Metropolitan Opera House, the J. Cleaveland Cady Opera House. I remember seeing in some work I did in Lincoln Center that Nelson [A.] Rockefeller, then governor, was willing to sign it up as a landmark. It was still torn down because, I guess, of Irwin [S.] Chanin’s bid on the property to make it into a garment center and the fear of the Metropolitan Opera Company, no longer in that building, that other opera companies would grow up in that building in the City Opera in New York, which looked more the part, looked more Parisian than did the new building—which everybody hated—and outclassed the Metropolitan Opera, which later happened with the city right at their own back door. But, that had nothing to do with it, the building was demolished, and there didn’t seem to be much of a hue and cry. Even more dramatically demolished to me was the Leonard Jerome House, which I don’t remember it was just before my time, at Twenty-Fifth and Twenty-Sixth Street on Madison [Square] Park on Madison Avenue. Not only was it among the first and last surviving robber baron mansions that had been the mansion of Leonard Jerome the racehorse enthusiast and father of Jennie Jerome [Jennie R. Spencer-Churchill] who married, as you all know, Winston [L. Spencer-]Churchill, it had been his house. But, from the 1870s forward it had been the home to clubs, countless clubs, the University Club, lots of clubs. I assumed it still had interiors. I don’t know how many were done as each club tried to recast its presence in the building, but that went down for a toy center banal slap in the 1960s without a whimper. I don’t remember any cause, I don’t remember anybody saying anything about it. What the heck was that? Was there nobody living there? Was there a deal as there had been at the Metropolitan Opera House? But those are buildings that shouldn’t have gone down and it seemed that given the buoyancy of Grace Church, that if the Landmark Commission dug its heels in it, it heightened its importance in the late ’70s with the Villard House and tried to work for that and then tried to uphold the law and then basically, in many ways, fell asleep. Q: So, did the Villard Houses spur your interest in preservation? Broderick: Yeah, well actually, it spurred my interest into Fifth Avenue issues. And I started the book on, which I am now back to, I started a book on houses of Fifth Avenue, all the houses, the long gone houses, and the people who loved them and the things they had in them, the collections, which I was working on at the time and then I got waylaid into McKim, Mead and White book but now I’ve gone back to the Fifth Avenue book. Q: So, do you remember who the key players were during this time when you said the Villard Houses where people were coming in and stripping the hardware and stuff, who were the preservationists? Broderick: It was Brendan Gill. Q: At that time, what were the wider kind of perceptions of the preservation field about what was going to happen with the Helmsley development? Broderick: You know, the tragic feature, I don’t know how many people will see this. Is this is getting written down or publicly published because it’s a factor I’m not exactly eager to say, but it’s very easy to see that the smallest community in the world is the preservation community. It’s tiny. It’s all smoke and mirrors. There was a lot of interest in the Villard houses. I remember one thing, Brendan Gill was the master at public PR and this is how I first knew about it. He arranged with the Municipal Art Society, who now had gone over to Kent Barwick, he arranged for a series of walking tours for interested parties through the closed, cold house and he would point out the hardware that was being removed and that’s how he told us the story. So, it was a public relations exercise and a very good one—that was very clever. The idea was to pressure the Landmark Commission into acting quicker. Q: Do you think it was successful in achieving that? Broderick: Well, at least it got them in there but I think in the end it was not as well adjudicated, as it should have been. It was rushed through, as a result more of the building could have been saved, and more of the building could have been more judiciously arranged, I think things were rushed through. But, what are you going to do, those were PC [politically correct]—was it PC [unclear] of the Parisian—about the first European decorative arts company to set up a base in New York City and I think they do so in about 1860, 1859 or so, in the Village that still has a presence here. When you see these handmade wonderful pieces going the pressure is to not allow that to continue. So, I guess everybody just jumped into the bed with the Helmsley. The thing I thought was most remarkable about it was that Mrs. Helmsley who had opposed every detail along the way to the best of my knowledge—now maybe the insiders knew this better but to the best of my knowledge she opposed every single compromise that was reached and in an effort to fund the Municipal Art Society they tried to give her the Preservation of The Year Award the following year, which I thought was cynicism and disgusting behavior of the first order, but in any case that’s what happened. I don’t remember if they gave it to her or not but in any case they certainly attempted it. Q: Do you think the situation might have unfolded differently if the developer hadn’t been quite so huge, so much money? Broderick: Yeah. I’m not sure that Helmsley had as much. Helmsley himself who was at that point going into Alzheimer’s disease and it was Mrs. Helmsley that you were dealing with more than he, I think, but he was sort of mister office building and I don’t think very many people wanted to take him on. Certainly all these people you don’t get to be that kind of figure in New York City by being squishing nice guy, but this was a new venture for him. Hotels were on Park Lane, he had done the Park Lane. They had bought a small amount of hotel property outside of New York City, high-end property, that they were running in a more historic vein. There was a house near North Hampton, Massachusetts, and I remember you see it from I-84 or I-95, whatever that road is that goes through North Hampton, you see it and that was a Helmsley hotel for a while. So, they were going into the hotel business but to them a hotel meant, despite this hotel in North Hampton, to them a hotel meant class if it was new and shiny and had a swimming pool or whatever. Q: Yeah. Do you think preservationists got many—was the concession that preservationists were sort of actively conceding, you know, in terms of the design of the tower or—? Broderick: It had nothing to do with it. I mean, partially I don’t know if the relationship was with—I remember the archdiocese, Monsignor Rigby [phonetic], was one heck of a real estate mogul, he knew what he was doing, and they wanted this to succeed with Helmsley. They wanted the—I believe it was on a lease, they wanted the lease to be paid as long as a ninety-nine, I think, year lease on it. Q: Do you think that the fact that it was the Catholic Archdiocese so it makes it particularly complicated? Broderick: Yeah. Nobody wants to—I don’t think anybody really, I mean, Brendan Gill was willing to do it. I often don’t have good things to say about him but you’ve got to say that he was brave to take on both the archdiocese and the Helmsley empire, both of them were daunting entities and they did. I’m not sure they would have—I mean, again I would love to know what happened with Leonard Jerome or with the Opera House, why those didn’t get the attention, but it was if there was a line in the sand with the Villard Houses and I’ve very rarely seen that line in the sand since—Grand Central, the Villard Houses, very few others. There was a building that I was wrong about right over here in the East Side. There were two high Victorian gothic convents or Catholic buildings, I don’t know whether they were both convents, but one was on Lexington Avenue just below your building here and there was another one over here on Eighty-Fifth Street and they were both gone. There was a half-hearted preservation effort to stop them and one was stopped on the justification that another one like it existed in the city, which turns out to have been totally gutted by fire years before so it wasn’t totally like it, but that building was torn down without much of a whimper, there was no line in the sand on that. And I can’t think of too many other lines in the sand cases in the last twenty years. Certainly the debacle of Columbus Circle where we couldn’t even get a hearing, not that I was involved in that one, but where you couldn’t even get a hearing, which struck me as being sad, you know, where is the bottom line on this. Q: Do you think there’s been any—was there any precedent set by what happened with the Villard Houses? Broderick: Not enough. Not enough. It’s all—I do not like the way the Landmark Law works. Now, people who know it better and preservation people would know this, I don’t know it too well, but my take of it from the outside is that it shouldn’t be such a political process. That it should be done by experts, there should be experts, there should be experts on the team who actually actively decide whether something is significant or not. Having us go down because they all were afraid of the church, all were afraid of Harry Helmsley, is not the way to do it and it shouldn’t be an issue of political—I remember being told to not get involved in Lüchow’s restaurant because it was a personal friend of the then mayor. We shouldn’t be doing these sorts of things and it should be above board, above politics, it shouldn’t have anything to do with elections and with donors to the campaigns, who were of course always real estate people. Q: Okay. And in that similar vein, how do you attribute the fact that the Coogan Building was landmarked and then un-landmarked? Broderick: I think they just wanted to shut up Sarah Landau. That, I think, although more skullduggery an issue, it wasn’t a beloved building that the Villard Houses or a beloved building like Penn Station. It was probably a significant building and probably a mistake. It happened this way. Sarah Landau, who was an excellent architectural historian and as I said, one of the first people to actually do things for landmarks and who became a landmark commissioner, stayed a long time, became the vice chair of the Landmark Commission went to work with Carl [W.] Condit, the great technological historian of Chicago, on a book on the real origins of the skyscraper, which would include New York City, a place where the skyscraper did begin, and Chicago, where it comes to full flower. Sarah, in doing this research, became aware of something Hitchcock—she was very close to Hitchcock, he thought she was an excellent student—and a phenomenon of the mid-Nineteenth Century where you unify five story, six story buildings in a single arcaded form that goes around the backs of the windows in a vertical fashion. It was something that was used in England. I just ran across in Hitchcock’s files, which I have, I just ran across a curious building in the Midlands that does it in that time, there’s something to it, and Professor Landau recognized this and makes a big fuss about this arcaded solution as something the early designers of the skyscrapers used to unify what are too tall buildings and give it some sense of cohesion. The predecessor for much of this is a building built in about 1876, one of the first purpose built clubhouses in New York City. Most clubhouses were in buildings like the Jerome Mansion, they used existing buildings, but this was the purpose. 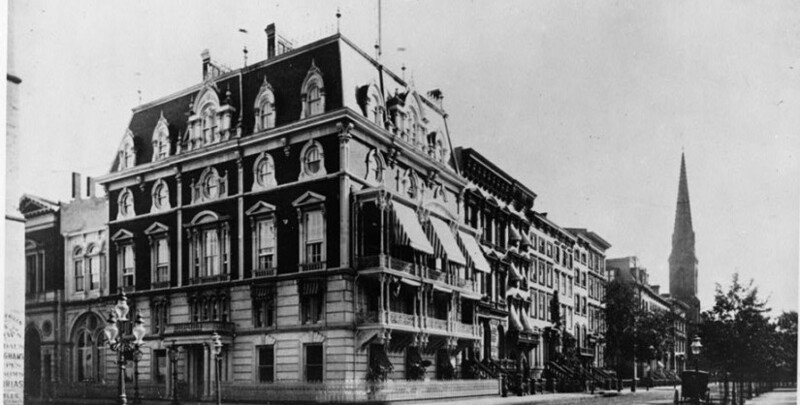 The Union Club existed in a purpose built building from 1855 forward around the corner actually on Twenty-First [Street] and Fifth around the corner from the Coogan Building. The Coogan Building was built for racket, it was a racket club, it was built in about 1876. It was built by an upper class single male New York group who wanted to have an athletic facility near their neighborhoods where they lived, which Twenty-Sixth Street was, on the corner of Twenty-Sixth, north east corner of Twenty-Sixth and Sixth [Avenue]. The building was not meant to cost a lot of money and it was meant to be sturdy and it was designed by a man called [A.H.] Thorpe, who sort of Landau discovered and who I’ve worked on a little bit subsequently. He’s very mysterious, we know far too little about him. He obviously came from New York City money. He was initially a part-time architect and was of the social class of the men who built this club, so, he was asked to do it, and he subsumes the stories in this arcaded treatment within the brick work. So, it is the kind of bone—if a finger bone from a saint goes into a relic quarry, so the Coogan Building, as it came to be known much later, The Racquet Club Building, so it is that same bone. It is the ancestor of the arcading, the ancestor of the tall building, the solution of the city, purpose built to look this way, utilitarian not to have a lot of frills and bells and gothic arches or whatever, or second empire features—at that point the second empire was just going out of style as was the high Victorian gothic. So, they would have been the styles that a more stylistically oriented, less practical architect would have done for such a utilitarian building, the fact it survives was a miracle. Indeed there were other athletic clubs on that block all of which are gone, in that area which are gone. So, here you have survival, it’s very important. It’s important because it’s early Ecole graduate. It’s important because it’s the stepping-stone on the story of the skyscraper, here is the counter argument. There was a man called Leon Edel from New Jersey who bought up those properties on Sixth Avenue between Twenty-Third Street, where the zoning changes, and Thirtieth Street or so, he put up four or five blocks there. It had been the flower district, as you probably know, there was an antiques flea market in the parking lot across the street, the area was underutilized and Edel realized this and bought it up pretty cheaply. It was said, I remember hearing this, that Sandy [Samuel H.] Lindenbaum, the terrific zoning lawyer or expert on New York City zoning code. He was the lawyer whose fees were the highest in New York City according to [The] New York Times article on the level of payment to legal firms and to lawyers who have a special practice in the legal firm as did Lindenbaum, that he was the most lucratively paid of any lawyer in New York City. It seems Edel had been going to him for years and had spent a lot of money with Lindenbaum getting the zoning changed. The zoning at that point precluded any tall buildings for Twenty-Fourth or wherever the zoning boundary, I think it’s Twenty-Third Street, but wherever it was, and he spent ten years paying off Lindenbaum, paying Lindenbaum. And the landmark community or the real estate community said it wasn’t fair to Edel. They had invested so very much money in Lindenbaum that he should be allowed to build the building. At that point, the BSA, the [New York City] Board of Standards and Appeals, could override and I think that’s what happened and they did override it. There was no community for it other than a man called Charles Savage who was a member of the Landmark Commission for a long period of time as an employee, an architectural historian, who happened to live a block and a half away, and he did show some interest in the building. Sarah Landau and I, I helped her, we literally walked that designation through. We put flyers under everybody’s door, we did them on light posts, we did everything we could to bring the name and very few people lived there—it was the flower district—so it was a few loft owners that came out and people did come out. And I remember particularly, what’s his name, Gaston Silva, I think, who later would go to the BSA, who was a landmark commissioner at the time, and I think everybody out of respect for Sarah designated it knowing that it wasn’t going to stay. It went down, this particularly banal building, which Mr. Edel did get to build on that site, but again, if this had been an era where we could have had people who could have adjudicated on the basis of history and on the basis of significance rather than who paid the most money to Lindenbaum. We’ve also had landmarks made to screw the landmark, and I got involved in that one and I will never forgive myself for that. I was called by—the key to this is whenever anybody wants to pay your taxi way, pay for you to go by taxi to see a building and write about it, the minute somebody wants to give you any money in that respect, you should go by bus. There’s an ulterior story to it and you should stay away. I learned this the hard way. I learned this on the Coty Building, which I actually thought was a very bad move on the Municipal Art Society’s—in their history and I dropped out of the Municipal Art Society at that point. They would suddenly say, “Come over here to the Society and work for us and volunteer.” Blah, blah, blah, and suddenly come over by taxi and talk about a window. It’s a nice window, it could have gone in a museum. So, I knew something was wrong. The same thing with a building on Sixty-Sixth Street and Madison Avenue, a building by one of the four of the city, which has very elaborate, ornate moldings all over it done by a very specific firm, they were remarkable details people of the early Twentieth Century called Harde & Short and they did the studio building on Seventy-Seventh Street and they did Allen Court [phonetic] on Fifty-Sixth Street just below Central Park. They also did an apartment building at about Sixty-Fifth and Madison and I was asked to come over in a taxi cab to look at the building to go down to the Landmark Commission and to testify about the validity of the building, and of course there’s no question it’s a wonderful question, and I did it. Little did I know, it was a landlord/tenant dispute and the designation of the building as a landmark was just to screw the landlord. That’s something you don’t want to be involved in and I was always angry about that and I fell into it hook, line and sinker. So, bottom line on this, if somebody offers—and I didn’t take them up on the offer, but I did do it and I was sorry I did it later on. So, we have to be careful of that. But in general, the Landmark Commission got used a little bit, was afraid of buildings and walked away far too much and we should have a dispassionate serious group who make a committee, who make a decision. In the U.K. there’s a special interest group for each time period, The Georgian Group, The Victorian Society, The Twentieth Century Group, SPAV [phonetic] and they hire what they call case workers, who are people whose full-time job it is to spot these buildings and to do the testifying—or sorry, to do the information collection and the testifying for it. So, did the politician from Bedford Park pay more money to the male candidates? I think we have to do this but it’s almost too late. We’ve lost a lot of good buildings in the last twenty years. The Landmark Commission’s line in the sand has been very weak. Q: Do you think there’s means in place now, or in the future—especially as a teacher, do you think that the power and the application of the Landmarks Law will be amended or changed? Broderick: No, I don’t see any help. I don’t see anybody—there are, in the landmarks community, there is a small handful of really admirable, truly wonderful, unsung heroes and there are policy figures among these admirable heroes who are truly one—I can name them. The most important person in the preservation movement in the United States is Tony Wood, who without a doubt is sane and has excellent judgment and cannot be properly thanked for all the voluntarism he’s done, and Kate Wood, and Andrew Berman and Arlene Simon in her own way, have all worked tirelessly and have never been bribed. If we can only get together enough gumption to get an independent landmark advisory panel and to get that through the city council… but I don’t see it as happening now. I don’t think there are enough people. I don’t think there’s enough screaming. And in a sense we’ve almost—if the idea of the Landmark Law was to designate all the important properties and then turn it into a curatorial role of taking care of the properties, most of Manhattan has—much of Manhattan has been designated. Much, not all of it, and still things slip through the net. Brooklyn is an important place. Little bits in the Bronx haven’t been done. Little bits in the Queens in the Twentieth Century line although Queens has been better, but the pressing battles are pretty much over so I don’t see that there’s going to be enough screaming to sever the political payoff aspect of Landmark Commission. Certainly, we’ve had a series of very bad Landmark Commissioners of late, who are totally uninterested in anything but keeping the chair warm and the action nil. Q: So, if most of what you think should be designated in a large way, especially Manhattan has been done, what do you think preservation will mean in maybe thirty or fifty years? Broderick: You know, by then it will be done and to some degree, it will come around trying to find economic resources to keep these buildings viable. Things can’t all be private houses and I think we’ve missed a couple of private houses that we could have had, but it will be to keep the building from being a shell into which you put Norman Foster’s firm tower or to keep it alive without gutting it utterly. So, that will be the major thrust of Landmarks. We’ll be in a different world. I don’t know whether I think—I think people still like to go to offices and meet and to talk one-on-one but a lot of people will be doing more at home with the telecommuting, so will we need as many offices and what will happen? Certainly, the solution that was pretty stunning is the ruination of the two buildings of recent decades, although the Hearst base, the Hearst Building base, which had not had a tower intended for it because of the Great Depression, on it had that new building built by Foster’s firm and to me seeing that launch out of that building, I don’t like it but a lot of people do. The more telling might be—and as I keep saying, I personally thought that the 2 Columbus Circle building was horrible from day one. I do remember it when it was finished. I remember it as the museum of Huntington Hartford [Museum of Art and Desing], where they had those wonderful Pre-Raphaelite Brotherhood paintings that are now in Puerto Rico—to me, you could have worked more creatively with that building. I don’t care even if I didn’t like it and even if I didn’t join the bandwagon to oppose its renovation, I certainly think it should have deserved a hearing. The fact that the politicians refused to even have the Landmark Commission hear it, which it had the requisite time periods, etc., was a terrible precedent and showed how illegitimate the Landmark Commission is that it just sat there and—what’s the words—just marked time, they didn’t do anything. The Landmark Commission was different in the ’70s. There was a wonderful woman who is still in the field, so to speak, at [Manhattan] Community Board 7, tireless and hardworking called Lenore Norman, who was the managing director or the manager of the Landmark Commission and was a good person and there were a small people you know better as architectural historians, there’s a woman called Marion Cleaver who was just a—well, wasn’t just—but was an administrator who took these things seriously and in those days if something was going on sometimes those people would kind of let people know how to handle things, they cared. I cannot understand about the current landmark staff, which is nowhere near where it was then, is nobody tries to—if you’re eager to work for the Landmark Commission and you’re a trained preservationist, how do you feel about not taking any stand on 30 Columbus Circle, or rather, 2 Columbus Circle, or any of these other buildings, to just play dead? And in my opinion, that’s what they do—they play dead. Q: How did it happen where we were in the ’70s and where it is now? Broderick: The Landmark Commission in the ’70s, ’70s maybe early ’80s, was at its high point. When there were enough people in the city who cared, were these small local preservation groups that are all tentacles of Municipal Art Society but a good move on their part. I think that’s something positive you could say about Kent Barwick. They founded little groups, Landmark West!, Longwood group [Longwood Historic District Community Association], the Friends of Upper East Side [Historic Districts] that they set up little—to make it look bigger, that they set up little branches around and that’s something that’s very positive and those organizations in their initial stage were very vibrant organizations. Landmark West! and the Greenwich Village Society for Historic Preservation, which is an older operation, still are around because they’ve got a powerful strong-minded principle, leadership. The other areas are as a good as the current person. There was a woman who was quite remarkable who deserves a high place in preservation history called Halina Rosenthal, whose husband was the sculptor, Tony Rosenthal, but Halina did a lot with The Friends of Upper East Side and every time she unfortunately did not—get a cancer diagnosis that time and she died, but those people are irreplaceable. Where are the new Halinas? By the way, unlike Margot Gayle, she came forward for other people’s causes, I had a lot of good things—and there was a human level, people spoke to each other, there was a human level, which helped broaden the appearance of the landmark group because these people went to things over and over again and they were strong people. There’s a man called Hal Bromm who I don’t know but I think he’s been active, Jack Taylor, who’s been active in the Union Square area for decades, these are people who are unsung heroes. They do wonderful things and have never resorted to working for any developer or getting some kickback money, so we have to give them a—and as I keep saying that is the pride of New York that nobody has done that. Broderick: Yeah, there was for a while an organization called Place Matters. Broderick: Does it still exist? Q: There’s a website and you can still actively nominate areas. Broderick: Yes. You know, I always say to the students, if I gave you ten thousand dollars to go on a vacation and you could choose where, you’ve got to choose between Dallas, Houston, or Paris. Where are you going to go and why? If we—considering that the main donors to mayoral campaigns, to city council campaigns, it’s the real estate community that’s dominating the city. To some degree I’m for the real estate community if they would act—there are some very good examples of people who don’t always ruin. There’s a way to keep the character of a neighborhood, which is in the developer’s interest—if you just build a Houston people aren’t going to pay big money to live on Columbia Street. So, to me, keeping that character is in their interest. Now, there’s a phenomenon, which again you guys know better than I do, there’s view tax and all that sort of thing, which has some unpleasant connotations to it. But on the other hand, if we just have a new building and if the neighborhood becomes banal, you’re not going to do as well as if you keep some sort of sense of the old days of the neighborhood. A good example is again very close to here, Yorkville. What’s German in Yorkville now? Nothing. Germans have always been a difficult issue because Germany of course became despised after two wars in the Twentieth Century, so keeping things German was not a cause. But even so, surely some of the character—I was not happy with the Lucida or whatever it over here. There were some very nice Neo-Grec brownstones, small 1870s tenements that were never heard, that went down in the dumper for that piece of glass nobody is buying now. I’m not happy about this. It’s difficult—occasionally when an architect is approached—the developer is one thing, the developer is looking for the big picture, we hope, and either making the money on selling the units or renting them and keeping the money coming in over a long period of time. So, it is in the developer’s interest to know something about the neighborhood. Not, that they’ve been conditioned to do so. One thing Landmark West! has done a very good job on, and this woman called Evan Mason, I think her name is, did a wonderful job doing was making these real estate seminars, which I’ve done as a volunteer many, many, many times to try to raise consciousness in the real estate community, but that’s at broker level, not at developer level. But I still think there’s a way to get developer level. I think we need to do a lot of education. We should be doing more of education in schools, the public schools, that’s where we really—kiddie schools, we should be out there. But, I think the bigger failures here are with architects who see a commission coming and sell out all scruples and all values to get the commission from the client. And I’m particularly mad about I think it’s the Lucida, the one over here on Eighty-Sixth Street as I just said, and the Pyramid Garage and the old Progress Club on Seventy-Second [Street] and Broadway. All of those buildings should have been heard and the Pyramid Garage was not allowed. There were other old stable in the garage blocks that could have been sacrificed, that was the good one, and it was done by an architect who knows better, an architect who claims to be a preservation person and who’s head of a preservation program at a major university. How you could do that even if you get a good commission for your office, I don’t understand. Back to Philip Johnson’s comment, go across the street, move air rights, do something. Surely there’s a way we can do it and I worry that New York will lose. Given the current economics in this country—in this world, I should say—and given the lack of new jobs that are being created and considering that many people may now have decided to tighten their belt buckle and not spend as wildly as they used to on credit card debt or home equity loans, something about the American populus and all of us fell too great victim of, are people going to stay in New York City if they don’t have a lucrative job. What’s going to make you stay here? Ecologically speaking, cities are far more carbon footprint happy. On the other hand, it is very expensive, schools are very expensive, getting around is very expensive, there’s no more grocery stores. So, what keeps you here? If the neighborhood is as banal as Dallas, aren’t you going to be going to another place where you can have the same effect at a cheaper price? So, if we don’t take character we can lose the city. It’s happening in London too although to my amazement about London, two years ago all the newspapers were filled with stories about who was the biggest economical capital New York or London and London was winning. And then kaboom, Lehman Brothers failed. But we haven’t seen the city collapse in terms of real estate. We saw some collapse in real estate here but not major, but this all could continue. After a while, you may say to yourself, “I was making so much money staying here. I’m going to move my family to Greenwich or I’m going to move—this sort of thing.” So, to me, the character of the neighborhood is very important in retention. The other thing of course we’re not doing and we should be doing in bringing in you guys, younger kids. How in the world can a young person come to New York without living five in a small building? You can’t live in the city at all. So, I think this is very important and I wonder where we’re going to put them. What we could be doing are things like competitions that are open—a couple of them do appear, again young people will know them better than I, but in things like Craigslist where people will say to themselves let’s have a competition on how we can find a place for a twenty-five year old recent college graduates that move to the city. Where can they go? How can we get something to work for them? The same thing what can we do with neighborhoods. Well, let’s have some competitions. Give them a prize. I mean, there was one for bike racks, design a bike rack and that’s a good thing. Get people involved. Do more. There are some fairly good now walking tour companies. There’s a woman called Joyce Gold who’s very expert, who does these very well. That sort of thing happens in good weather. But even now with the empty shop fronts, what I keep saying to Landmark West! who’ve done these things in the past, couldn’t there be historic neighborhood signage, billboards, photographs, what we don’t want is empty streets and wouldn’t that help buying people to a neighborhood. The thing that’s so funny is I have lived on the Upper West Side for thirty some odd years in the same apartment for the obvious reason that nobody can afford to ever leave where you are. But, I do feel part of the neighborhood, which keeps slipping away. Young people go from neighborhood to neighborhood because they’re just looking for—so, it’s very hard to get any allegiance to a neighborhood if you’re only there for a year or two, if you keep moving. So, what we have to do is try to install that. And walking tour or landmark event or preservation event is cheap entertainment, it’s cheaper than going to a movie, and I think we’re going to have to be looking to cheaper weekend pastimes so isn’t this is a time to have some clever ideas. Go over—there’s a church now that has been battling for landmark status and has it but it’s endanger of having its landmark status overridden like the Coogan Building shortly at the [New York] City Council and that’s called West Park Presbyterian Church, which is a very important building. A red sandstone building of the Richardsonian-era, very rare in the city, although Harlem has wonderful churches and I don’t think we’ve taken them on either. Sorry. I don’t have allergies; I’m allergic to the western world. The question with that building, it’s a building that’s in bad shape, there’s a history to it. It’s been abused for the last thirty, forty years, not having money and this brings us to a very big problem, which is how do we pay for needed repairs on landmark ecclesiastical structures and the answer is it’s really miserable and I don’t know how either. There’s Bondek and that sort of thing but it’s very difficult because of the church and state and it is not fair in this day and age for us and the Landmark Commission, especially people like me who don’t go to religious services, to say, “You must retain West Park Presbyterian Church because it’s landmark.” Which it is and it should be, it’s got all the characteristics to do it. But, how does the congregation, if there is to be one, how do they pay for the roof and that’s where all of us should be paying. Not maybe a view tax but we should be figuring it out. But in the meantime, in the middle of this, why not invite over the—why not have a day there where young people go in and decide what they’re going to do and see if they can’t find a way. What would West Park in your neighborhood mean? Retaining a landmark means you have buildings that can be used for the AA [Alcoholics Anonymous] meetings and for twelve steps and for the Boy Scouts [of America] and the Girl Scouts and that’s all nice, but is it fair that that’s the only thing that a church can do? How about something that makes them some money—they worry about that roof. So, isn’t there a way that we could change it so that if they do a—if they were to get a movie contract and I see minor code that the television shows that they make in New York use [Church of] St. Paul and St. Andrew and St. Agnes [Academic High] School repeatedly. Now, if the church gets it they have to pay taxes on it. Wouldn’t it be simple to make something like a—and again, preservation people may know more about this than I do, but wouldn’t it be the proper thing to have a building fund so that the fee for making a movie goes directly into the building fund, so that it doesn’t get taxed and can be used for a general good like the roof. The other thing with St. Paul and St. Andrew’s or West Park is if you have cooperative community where the religious people don’t want to just sell out, why not invite in the neighborhood and make a competition and say what else can we do in this building, with this building, other than Sunday services and some goodwill in the neighborhood. How else can we make this is a viable center of the neighborhood? And that would make people who live there feel a part of it and it’s something you could do that doesn’t cost money and it could help you launch a career if you were a young designer or something. So, to me, we should be employing more young people in the city and getting them interested and getting them to do it. Q: The solution in the past has often been for churches and religious properties to try to sell off a portion of the property and develop it and usually in a way that’s largely unsympathetic to the fabric that’s already there. Broderick: Sure is. And the Landmark Commission when the Upper West Side district, which I worked on as a volunteer, was done, you’ll notice that they always leave the parish houses so that that could be done. I think the Landmark Commission does it on purpose, it’s a sop, because they’re always sure—the Landmark Commission since its inception has had this sort of—it’s a way too old a reference for you all, but there was a television actress I remember when I was a child called ZaSu Pitts who was a real old time, must have been 1920s, ’30s actress but she was still around doing character roles and her specialty was pseudo panic, pseudo girlie panic. She would go, “Oh. Oh, my dear what am I going to do?” The Landmark Commission has acted that way. They have been in this mode of saying if we’re not careful the whole structure will collapse and that’s why they walked away from many of these battles that they’ve walked away. That’s why in a way the West Park Presbyterian was such a perfect—I actually sort of hoped it would go to hardship because it has an active protest community and yet it’s a major building. Sooner or later, churches have to go before [unclear] test case for the hardship clause and it would be nice if it’s a building that has one hundred percent quality and one hundred percent has a neighborhood that’s willing to find it, fight for it, but again we shouldn’t go on hardship. It shouldn’t be quite that way. We should have a panel of probably changing historians and architectural historians and real estate community and there should be a panel that acts for potential designations in the city and another panel that acts for economic advisory free advice for buildings that are landmarks that need to make more money or need to get a roof done and get it out of politics. Q: Since there’s always been a body of research that shows, demonstrates the economic benefits of preservation. Broderick: And not to mention the carbon footprint. Is it building construction that is forty percent to seventy percent of the city’s waste is that sort of thing? Good lord. If you went to Europe or Europeans who visit me tell me when they come on the street and see all the wood, you know, when you walk down the street you’ll see Christmas trees and you’ll see old windows and old desks and that sort of thing and that wouldn’t exist on the street for a minute in Europe. People would immediately be using that, if for the wrong way for firewood, but they would have figured out a way to re-salvage it [unclear] too rich and that’s a big mistake. Even if we say you can build a sensitive addition behind a building we could do that and get some economic or under it, something of that order, but that’s again something that a panel with expertise could do. The way it’s been approached—organizations particularly have been bad for churches and religious properties, they’ve gone in and they’ve been able to do whatever they wanted and churches have had a tax free environment so they’ve gotten their fire department calls and their police protection and their schools if they have clerks with children, all free, garbage pickup free, they in a sense do owe the community a little bit. But, they’ve tended, the bad ones, have tended to act very arbitrarily and just said, “No, don’t talk to anybody. We’re churches. We’re above the law.” And this is not good and instead of working with the community to see if we can’t get something. The sums have been too tempting. You take a congregation, small often, with a lot of sad people in it rather than an active community—and we’ve got a lot of those—and you say to them, “Look, you have to work with the community and you have to fix these things up and you have to do some work.” They just want to wash their hands of the building and get twenty-two million dollars or whatever it is for the new tower. The fact that that twenty-two million dollars will be gone very quickly and so will the clergy and so will the congregation, doesn’t seem to be a factor. It’s a miracle that comes in and it’s just like winning the lotto, it just lands on your head and you’re safe from economic worries for a while. The tragedy of this is how many of these churches have spent their endowments down in the ’80s and ’90s, West Park is one of them, St. Paul and St. Andrew, they didn’t have much but their endowments went down and again it’s harder to look to find a Bondek or to look to find CSI [Compassion Service International] trucks but surely there is something we can do. Surely, there are ways to get this to work but there’s just been unwillingness in some religious circles to undertake this. Q: Well, it seems as though most of the time when a building of significant merit is torn down and something replaces it, it’s ever too often short-term kind of motivations that drive it and the long-term sustainability of the site, economically, environmentally has been put on the back burner. Broderick: That’s my particular fetish at the moment. I don’t know whether you know—and I should have brought the materials, I didn’t think to—that I actually some years ago was asked to do a master’s program at NYU and I think the idea would be another preservation program, which is not right to Pratt, to Columbia, and eventually it hit me that the answer is just what we’re talking about, is thinking of ways to recycle a building, what can you do with them. So, starting next fall, we’re going to have an adaptive reuse masters that will not be advocacy, that will not be architectural history, it will only be economic exemplars of what’s worked and what’s failed, which the students will look at in Europe, not here. So that they will see how it’s been handled in other places, both good and bad, and hopefully will come back to their homes wherever they may be and be able to say, West Park could be a, that sort of thing. I’m hoping that that would give a special—some small things, not meant to be large, it’s small and hopefully they’ll bring back some expertise that will be helpful here. Broderick: The idea is it would be sustainable as well as—it’s preservation but recycling. It would not be about how to make a house museum or get the parks to take care of the Litchfield houses, not that. It’s about buildings that a part of the every—it’s your Cobia [phonetic] Street—it’s buildings that are part of the every day fabric, how we can make something under—there’s a Prudential insurance in England, which is not related, I gather, to Prudential [Financial] here, had a big [Alfred] Waterhouse, a big red brick office building of the 1880s near Jerry Cross [phonetic] at, it’s near Holborn and what they did was build a little under it, build glass buildings along it. They redid the floor plan because there’s no reason not to and saved a couple of the important rooms, which could be used for events and that sort of thing, and they’ve got I guess a huge new office building in historic without damaging the building, without creating much stress and this is I think the ideal. Nobody said that the goal has to be to make the most money. You have to survive but it doesn’t mean you’re entitled to always get twenty-two million dollars for their site. So, that’s the life, liberty and the pursuit of happiness, not necessarily the pursuit of the golden brass ring or whatever it is. So, I’m hoping this will take on. It certainly is a major factor and it’s very slow to happen in New York and in America in general. Q: Why do you think that is that Europe sort of precedes USA? Broderick: That’s why I’m so big on school programs. I did—attempted this for a very interesting right to life, a woman called Kate Ottavino, who tried to make a high school curriculum, a regent curriculum for people who go into preservation, caring for buildings, you know, doing the work. I don’t know what’s happened to it but it was a really good idea. And again, outreach to unions, to high schools and to kiddies and I think that’s what makes Europe different. Have you ever been to the Rosetta Stone? Broderick: Well, you couldn’t get near it. It’s filled with young kids brought by bus from Poland, from former Yugoslavia, from all sorts of places, brought all the way in to stand before and to have their history become real because this is the real Rosetta Stone. Europeans have different sets of history. They are brought up to think that retention of their historic structures and their own culture is important, Americans are not. We’re brought up to think everything new is wonderful and glamorous and Donald Trump is a hero. I mean, how in a world—here’s a person who has no interest in history, no interest in the betterment of anything, and that is the American efface. Students in the 1980s, I remember trying to teach students who all wanted to be Donald Trump. There should be no preservation, there should no rules, there should be Houston, you know, just other rules society so that the capitalists who can achieve, do and it’s just a different approach. If we could manage to get kids in school and schlepp them to landmarks and give them—have people come who have always volunteered, not that I’ve ever been asked much, I always volunteer to take them around to do that sort of thing, that’s where we should be trying to change the way young people view preservation. Broderick: That’s a little bit better but you’re right. Q: Yeah. And the value of buildings, especially in New York, but in general, I have an instructor who’s more of the material conservation but it’s not hands-on, it’s sort of this odd class, but he’s a landlord and he’s a developer and he says buildings are most beautiful to me when it’s making me money. Broderick: Right. That’s the answer. I remember in Florida, if you go to Florida, that people move from one new—now, that they’re all condos, I think the condo movement is changing—but as renters I think what you would do is—I remember I was told by one of my instructors many years ago told me that every three years when the apartment was up for being painted they would move to a newer building, just finished building. And I think that that was kind of the thing in suburban, that’s what the mansion is. There are enough mansions in Westchester and Long Island to buy so why build a new Mc mansion because it’s brand new and it’s got the technology, it’s got bundled wired but you can put that into an older house too, but I think that was the idea of it. It’s new, nobody’s lived there, it’s clean, and nobody’s lived there. It hasn’t got anybody else’s cooties or in this day and age bed bugs. I think that’s an issue but I think the condo movement is changing. What I don’t understand about the condo movement is there are two new buildings, one by Extell [Development] and one by—I don’t even know who the developer is, one of the big ones, Ruben [Companies] or somebody—at Fiftieth [Street] and Central Park South or Central Park West, which deliberately tries to emulate all of the features of Park Avenue apartments, the great apartments in New York City, which we have a lot of early Twentieth Century great apartments for ten times the cost. If you want a great pre-war apartment, why don’t you just buy one, there are plenty of them they’re not in shortage. There’s going to be more of them as these underemployed financial services guys depart from the city. Mind you, those buildings were designed before the economy changed, but why pay eighty-nine million dollars for an apartment that on Park Avenue would cost—Brooke Astor’s apartment, what’s that costing now, they had it at twenty-four or something. Why pay three times more for something that emulates what you’ve got? Yeah, of course, the wiring is already there, that’s true, but that’s not going to kill you to have somebody put in broadband. Q: Yeah. I think too, I think it goes back to what you said in terms of on a broader scale there’s too much material wealth and being able to afford to stop using things and then just throw it out. Broderick: Just throw it out. Broderick: Yep. But of course speaking of the carbon footprint idea, the building suburbs, which is really an America thing, it starts in this country and we do it in Chicago, we do it in New Jersey—the early Oak Park and what’s it called Llewellyn Park and Orange, and those sort of areas in Yonkers—the building of suburbs was a response to all of that wonderful open land not too far from the city. After World War II, this changes. In the ’20s, they don’t leave. In the ’20s, we get the Grand Concourse and Queens Boulevard and its multiple drawing units for often immigrant, first generation Americans of immigrant status or background. After World War II because of rent control and other things, people fled to the burbs and developers like [William J.] Levitt and others made it so attractive to them and so the suburbs just kept going farther and farther and farther into the potato fields. Now, how in the world can you go to work and function if you’re commuting two hours each way? But, on the other hand, there was another tacit agreement and then you were living in a community of all people like you and the schools were different so that’s why they did it, that’s what they would have said. Today, we say well, wait a second you’re wasting enormous—living in the suburbs means you’re hating the neighborhood, your house is not well built to retain the heat you spend on it or the cool temperatures in the summer, you’re spending a lot of money on gas, we’re polluting the earth and most devastatingly of all, all these cul-de-sacs that have ruined the rain flow so that the storm issues become more, you know, things are not draining the way they used to because there are too many cul-de-sacs. So, will the suburbs as we know them continue or will most young people, as you, come to the city after college, no matter where they go to college and no matter where they grow up, many of the suburban kids grow up and come to the city, come to the city, go to Columbia Street, go to Brooklyn, go to the less expensive young people areas of the city and stay here as they did for a decade. Now, after that decade these people would often go out to the suburbs again when they married or for whatever reasons but maybe they’re not going to go now because maybe the ecological issues and the endless commuting do not seem worth it to them. So, maybe they’re going to plant their trough in New York or in any city and I think that’s an interesting idea because those are people who are starting to make the schools—New York City public schools were revolting and parents are taking them back. Parks, things like that, people are taking them back because they’re not going to the burbs. So, maybe we’re going to see the burbs end up like Detroit and people coming to the edges of city. On the other hand, the economics of the current picture and the fact it is so expensive I’m not sure how that will factor in. But, I do think young people are becoming more urban and therefore will become more historical in their approach. Because one of the things you do in Europe—where do young people meet if they backpack to Europe? The meet each other at the museums. So, I’m hoping maybe it will lead to an interesting walking tours and that sort of thing. Q: Yeah, I would say there’s absolutely an ever-increasing amount of interest in urbanism and urban life and urban history. Q: I mean, it’s a glorious kind of image to imagine cities become denser in a well managed intelligent way and then rural community people you have to live in rural pockets doing so then the suburban sort of rings kind of going back and returning to their rural kind of wooded kind of roots and then only passing through on the train or electric cars. It’s definitely compelling and it’s an optimistic view of the future. Broderick: It is. It’s an optimistic view. I do hope, I think the biggest problem with infrastructure world that we’re supposedly getting in the packages that come from the federal government, these grants for creating jobs, the thing that I don’t see anybody doing, maybe I just don’t see it, that’s very possible, I don’t see people trying to figure out how retrofit buildings for better thermal, you know, thick old buildings, the Racket Club, the Coogan Building, the walls are so thick that heating and cooling in that building would have been easy, it would have been ecologically viable. What I don’t see is people, I mean, yes, you can take the shingles off your suburban house and put in that Tyvek or whatever that’s stuff called, but are we doing enough to figure out how to acclimatize existing buildings. The new ones are being built that way, but the old ones. What do we do to Levittown, how do we make Levittown continue, because people can’t afford the fuel and the taxes and the insurances. So, why aren’t we doing that? Maybe there are people I just haven’t run across it but I’d sure like to see it. Q: Yeah. You’re from the North Shore Long Island, right? Q: I think Long Island is very interesting in a lot of ways for exactly this. There are people who very much want to see them in suburbs changed like the United States and so preserving places like Levittown in many ways is important. But then, how do we make it better and how do we turn it into something that’s viable? Broderick: That’s true. It’s changed utterly and Levittown is a wonderful example. It was initially, as you know, the Levitts family, his father, and he’s now gone too, the two generations of them did develop. He’s following in high end developing and that’s out of Philadelphia and in a place called Roslyn or Manhassett Long Island in the ’30s. Rather nice, compact but nice looking houses in a historicist vein. What he realized in the potato fields of the Hicksville plains there was that it was flat, potatoes were not a lucrative crop and he took industrial techniques and applied them to building houses. The brilliance of this was that there was very quickly a generation of boys coming back from the war who wanted to forget everything and couldn’t come to New York because New York already had rent control in its apartments and they had nowhere to go. They wanted to forget the war. I can’t blame them one iota. So, he built these houses and they were $60 a month to rent, $100 a month to buy and they even had a washing machine so they were perfectly suited to the group that came. Now, the original Levitt Cape Cod, it was originally a rectangular house and it was deliberately left with the upper story ambiguous so that people could make more rooms and expand the houses as they expanded their family and people did and the amazing feature of Levittown is nobody left the original. There are no more Levittown houses at this point; I think they finally found one. The Smithsonian [Institution] decided to come in and save one real Levitt house, they couldn’t find one because everybody’s made them unique. People don’t like living in the same unit. But, what’s happened to Levittown, although it’s probably got a fair number of charities who were original tenants, original owners, so it’s probably got some people from ‘47, ‘48 forward. Most of the children of Levittown have gone and it’s become a working class neighborhood even though it’s surprisingly far from the train. That’s a surprise, four miles from the Hicksville Station, which strikes me as being too far for working so you’d have to have a second car. It’s become Hispanic and it’s become a working area for—and in a way it’s kind of what Levittown was for originally a place for people to go for a period of their lives. But, the people who are there now, ecologically though their heating bills are high and the drainage is an issue and the taxes are probably an issue and what will happen to something like that. That’s why the Smithsonian took one house, they tried to grab it for the museum as an artifact of this time period. But I could see, I mean, it’s hard to believe but if we gentrify—because what we’re doing, as you all must discuss this in school, I mean, I’ve never heard it, we are in an effect creating a problem for working class people. To me, the way to solve this is to get them involved in their own community and keep them there, don’t necessarily—if you keep the people who are in the buildings and don’t push them out but get them involved, but if you’re being pushed out of a neighborhood where do you go? Well, sooner or later maybe Levittown. You know, that may become the new slums. Q: Yeah, that’s the other side of an unfortunate consequence of preserving neighborhoods. Broderick: It doesn’t have to be. You know, to me one of the things that was going on in the ’70s, I thought it was wonderful, I’m not sure if it still is, they would in poor areas of the city where you had a lot of in renting and you had a lot of old landlords fighting, milking the building enough that they were walking away from the buildings, not paying the taxes, not fixing the boiler and it was a mess. In the Lower East Side, in China Town and those areas, and amazingly there was a movement, which had some artists in it and the movement was to rebuild the housing, repair the buildings, don’t tear them down rebuild them, with a lot of the sweat equity coming from people who rented them or squatted in them and in return they got to stay there and to me, that’s a way to bring the neighborhood back. Bring people who are interested in the history. Of course there are certain things you can’t do. You cannot do electricity and you can’t do the plumbing so you had to have some professionals who come in for the trickier business but the regular business could be done by locals and it makes them part of the neighborhood and brings the neighborhood back. You know they say that in the old days in New York there was a neighborhood, it’s before any of our time, where if you needed a check cashed before ATMs—I do remember that era before ATMs—the neighborhood liquor store if they knew you or the grocery store if they knew you might sometimes spring to cash a check but there was a real neighborhood. It basically ended during the war, Second World War, and fear came in. New Yorkers were not afraid, there wasn’t much in the way of crime and a lot of it came it with the brown outs and a lot of it came in with the economics of the era, those who weren’t on the bandwagon in the ’50s were left behind. The decline of buildings and the decline of interest in a neighborhood followed and when you look at those housing units that were built heavily after the war [unclear], although there is a community in protecting each other, dangers crept into neighborhoods, people had become alienated, they no longer have—what store is in your neighborhood now, which is run by ma and pa? There aren’t any. You know it’s all chains, it’s Claire’s or Burger King or whatever it is, there are all these large companies. So, there’s no more check cashing, there’s no more somebody knows you in the neighborhood, there’s no more compelling sense of neighborhood. If we got people to rebuild their slums, you know, rebuild your building you get to buy it, keep it interested in the neighborhood, we may grow it back. I don’t know who’s going to go into—retail is another whole area that’s not talked about here. You know it’s not landmarks but again it’s this other thing that does come into it. How do we preserve the last of the average bars? Well, it’s not the role of the preservation community to do that but on the other hand, I hate to see all this going. After the landlords got so greedy and they were getting $60,000, $70,000 a month for little shops who’ve now left, you know, they’re now empty, do we really want just Burger Kings and Claire’s. Why did we go to New York City if there isn’t something we can go to that we enjoy? So, maybe bringing people back into the neighborhood and letting them stay here maybe they’ll still continue to repair shoes or other passe things. Q: Yeah, preservation, you know, because small businesses so often find a home in older buildings there’s a really compelling relationship there. Broderick: Yeah there is and there are all sorts of underutilized spaces. Not only are there the areas below ground on the side streets, you know, in basements, which could be retail if you did the right thing with signage, or the first floor, we could expand that. We shouldn’t lose shoe repair shops. We shouldn’t just buy shoes and throw them away when they can saved. We could recycle a lot of things and those are the people who need the cheapest rents. So, another thing we could do, that’s another thing that could happen with a landmark building, with a landmark building that doesn’t have enough going on it couldn’t the municipality or the neighborhood have special rates for people who repair shoes or that kind of world. Couldn’t we keep that alive in the neighborhood to keep the neighborhood going? Again, it’s a dialogue but what would be so wrong with sitting around in community board meetings and just hacking this stuff out, open to the public of course. Q: Yeah, there’s a definite acknowledgment of the necessity of these things. I live in Prospect Heights and there’s a man that comes around with a little cart that sharpens knives. Q: You know things like that they’re wonderful aspects of city life. Broderick: I agree. There’s a guy—I still hear there’s a truck from New Jersey that comes into my neighborhood that does it on Sundays. The problem is, here’s the problem, I think I’m the only person in my forty-six-unit building that cooks. Broderick: I don’t think anyone else cooks so what do they need the knives sharpened—they all have these gourmet kitchens and they order out so that’s another problem. And of course there are no grocery stores so it’s got to be Fresh Direct or whatever it is. But, I agree with you, I love these, I love getting my shoes fixed thank you and I want to get a key made from a key person not a machine, I want to see this. We live with the category killers of New York City are the pharmacies, which have become these Duane Reed superstores that sell you the garbage bags. Q: Yeah, and a lot of times in the lower income communities they’re underserved by grocery stores, they’re underserved by everything pretty much but chain stores when you approach from a planning perspective, drug stores are what people want. So, the balance between preserving the neighborhood and what’s good for the neighborhood along with what people need in their immediate lives it’s difficult to reach I think. Broderick: You know, to me I agree with you. The Upper West Side, where I live, had a lot of this, had a lot of possibility but they’ve been closing the neighborhood shoe guy, as is now, a long time ago like eight or nine years, he told me he was losing $1,700 a month keeping open. Q: Oh my gosh. Yeah. Broderick: He didn’t want to quit but nobody brought in shoes any more. To me, I think it got so expensive that the only other chains—now the chains are trying to write their leases so you’ve got empty shop fronts, which are crime bedding. And back to that discussion we had a few minutes ago, to me if I am a yuppie and I’ve been fired by Bank of America I’m not probably going to go back to work for the financial service people and I may have gotten a good settlement, but why would I stay in New York City when there’s no local store, when groceries are a hassle am I going to stay here or am I going to go to someplace where my money will last longer. So, the point of New York is that you could run around to the store and you could get X, Y and Z and it goes back to your drugstore comment as it goes back to where there was a pharmacist you trusted, that’s gone, and the drug stores have become cosmetic shops and house ware supplies, they sell you your toilet paper because there is no grocery store left. So, in a sense, we’ve lost that aspect, they’re just big chains and they just gobble each other up and there’s nothing left. Q: You know when you have a group of people who care about certain things or there are overlapping interests that come into play. Q: But what about in a preservation battle when there’s a group of people who have different agendas, like how in your experience is that—? Broderick: To me the way it’s usually worked is there’s one really strong figure in each of the individual—I could tell you, I could think of a bunch of little preservation battles many of which didn’t work. There was a synagogue, I remember it, on Seventy-Ninth Street and Columbus [Avenue] that was one of those 1920s synagogues so stylistically they proliferated—[unclear] it was called, they proliferated all over the west side, all over Brooklyn there were plenty of them they weren’t in short supply. And there’s a local movement that didn’t get—the only claim to fame they could think of was that Marvin Hamlisch had been bar mitzvahed there and that one did not survive, rather like these convents that we saw here. A lot of these battles were lost if they didn’t have a shiny person who’s view was obstructed, a really hard working local who wanted their view therefore wanted the building to survive or one of those little Municipal Art off-shoots like The Friends of the Upper East Side to spearhead these organizations. It tends to be one person. These movements are one person and they are so burned out when they’re finished that they disappear but it tends to be their issue. And maybe they’ll bring their neighbors, their friends, it’s burnt on them because they will work for several years. They’ll often spend a lot of money of their own and certainly doing a landmark battle yourself is exhausting. We did it for St. Paul and St. Andrew. I did a lot of work with other ones, with Sarah’s Coogan building. It’s exhausting. It takes up all your time. I don’t know how many people are willing to do it but it tends to be people’s friends or it doesn’t tend to people with—and many people with a view when it comes to actually doing something disappear. Broderick: That’s right. That’s right they’re not going to kill themselves. Especially if we have a transient group. You know if you have people who are renters and they think they’re going to go elsewhere or they’re twenty-five-year-olds who are going to go to the suburbs one day they’re not going to do it. The one thing that’s changed a little bit and I think some of these extend to historic districts, there are said to be some fifty of them up now, sometimes that has more power because it is literally all code bars. So, even if they don’t plan to be there very long they want the prices to be high for when they sell it so that could be, [Riverside]-West End Avenue Historic District can be—but it tends to be one strong person. Then at the moment it’s a formula because we’ve lost the shiny people, because many of these areas don’t have a local group or the local group is too busy to take on their cause alone full-time, you’ll end up with one strong person like this Erika Peterson preservation group [West End Preservation Society] and what they do is once they learn painfully about the Landmark Law and about the problems and about the City Council and once they’re given that very depressing speech about how bad things are, they will somehow find one rich neighbor willing to hire. It is universally under [unclear], do get some students I guess to do it, and they produce a proper document, which you use as a fundraiser and which you use to bring to the Landmark Commission. And actually, it’s the stupidest thing imaginable because the Landmark Commission has a staff of proposed, supposed historians who were supposed to be doing that work who spend a lot of time in libraries skiving and then you bring in the staff limitation [unclear], which is of better quality and so what are they doing. Its two people doing the same thing, they’ll go out redo the research on your tax dollar, which doesn’t seem very sensible. Q: Yes. Anyway, and plus in what you’re saying I think is that the faith is sort of—and the economics of preservation, the good economics that could drive, reuse and drive interventions in buildings, do you think that that is sort of where preservationists who are coming up in the ranks I guess should invest? Broderick: Yeah, that’s what I think. I think we’d love to see some more people like Dan [Daniel] Brodsky who are doing their Prudential in England. People who are—well, I’m not sure that worked economically for them because there’s a shortage of tenant Roth’s [phonetic] buildings right now—but what we need are some good examples that are going to promote it. To me the major problems of preservation are the two prime, the big one is it shouldn’t be connected to politics at all but given that that’s not going to change, it should be schools. School groups should be educating the young. And B we should be doing PR. I talked to Tommy [phonetic] more about this all the time, we should be trying to get on Channel 1 and we should be trying to get PBS to do—when I was working on the McKim, Mead & White research I ran into a character of earlier generation, long gone, called Aline Louchheim [Aline B. Saarinen], she’s an interesting woman, she wrote some books on the Louchheim name. She then married—she had several marriages, her last marriage was to the younger [Eero] Saarinen of TWA [Trans World Airline] Terminal fame, and all the papers were left the Archives of American Art and I read them and they were very sad. She was a very talented woman who wrote a great book called The Proud Processors a very good book about early American collecting way back in the 1960s. As that was finished, she was given at a job at CBS to come forward as a cultural—to be the Walter [L.] Cronkite [Jr.] of culture. She was going to go on the new television and news broadcasts post-war, you know, and I think CBS was a class act then, and she was going to go on and do opera reviews and talk about buildings and talk about—and then she got a brain tumor and died, it didn’t happen. I keep thinking what if somebody who was charismatic had done that, how wonderful. Why can’t we get on a station that’s desperate for news often, why can’t we get a preservation battle on that, why can’t we get some walking tours on there? I mean, there are all sorts of things. Get us in the media. Get the information out and get—Margot Gayle one hundred years ago wrote a column every week in the [New York] Daily News on New York Then and Now. This is the corner as it looked then, this is the corner that it is now. Do that. Just get the word out and we could change the—because your generation, younger people, are not anti-history the way their parents used to be, they don’t want to go in a new apartment every three minutes. It would be wonderful if we could just find a way—and in magazines do it free, get it on TV, just get it in there. The main thing is to get some sort of base to change the way people think. Q: Yeah and to have, I guess, maybe people who care but don’t realize that there’s a means to involve themselves and seeing what they care about come to fruition. Broderick: I used to say to Tony, to me—I went out with students a year or two ago to see, they’re doing a restoration effort of the World Fair’s Map, that thing, this remarkable man, Frank [G.] Matero. We went out and visited them and we took the kids to Queens Museum, which is desperately in need of many more things, and there’s the model of New York that was made for the ’64 Fair but was updated through ’92 or so. Well, that’s a perfect visual path because here you could photograph this block in 1992 and look at how this block is today. You know, there are wonderful opportunities it just means a little effort, not a great deal. Broderick: Easy enough to do. Broderick: Do a weekly column. Broderick: Get in these little newspapers, something called the West Side Spirit [The Spirit], the East Side Spirit [phonetic], it’s a chain, get little things in there. Broderick: It’s been forest fires, lots of forest fires. Q: —and there maybe hasn’t been the room to do that work. Do you think that’s possible? Broderick: Yeah, I think that’s possible but I also think that people are so worn out from the forest fires that instead of continuing it loses steam and then people just take a rest. And, you know, after one of these battles you are exhausted. But, there are more institutions in place, this preservation project, more of the neighborhood groups, there is more to back you up. I think we’ve got—if we only could get—and I gather there’s a new person at the Municipal Art Society. Maybe there’s hope—the Municipal Art Society could be a vital force in the city. But, the problem is, all these organizations that could have a strong role are underfunded so they have to spend their money sucking up to people with money and who’s got the money, the real estate community. So, they’re tainted. Broderick: And I think this is true with this—what’s the other one—the [New York] Landmark Conservancy, what the hell do they do? I see very little—they have big benefits and the people who come to the big benefactions are the real estate community so they don’t take battles. So, we need to reinvigorate the organizations. Q: Yeah. I mean, that’s a huge problem though how to fund non-profits and especially in economic times like these. Broderick: Correct. Well, you know, what the [Barrack H.] Obama campaign learned and taught us is that the $5 from many, the Twitter, you know, where you text it in, the way the Haiti thing worked, that—of course look at the desperate—we’ve just gone through the NPR fundraising effort last week and chapter 13 its going through it now. It is ugly and it’s unpleasant and it’s repetitive and you lose respect. But, if it could be that—you know, I think people all they do is call you up when they want more money, people can afford only so much. What about if there were more $5 things that worked? That might work where it goes in somehow automatically every month, $5 every month that sort of thing. Because I wouldn’t give a nickel to the Municipal Art Society or to any of these organizations if my life depended on it because they’ve been really creepy. They’ve spent a lot of money on themselves and they haven’t done any work. Try to get the Municipal Art Society to do a case in Brooklyn or another part of New York City other than the Upper East Side, you know, you couldn’t get them to go anywhere. So, they have to reinvent themselves and I think a lot of people who work for them end up getting burned out and don’t do it. Broderick: It was, as I said, it worked in the ’70s. They had a group of young people who were vigorous, who were serious and of course after a while as with young people they get another job and they go elsewhere. But they weren’t able to retain that, you know, they just went to sleep. I don’t understand exactly how, but they did. Q: —that that could be really different? Broderick: Yeah. The trouble is we’ve got—[Rudolph] Giuliani was an anti-landmark person and [Michael R.] Bloomberg has been an anti-landmark person, so we’ve had sixteen years of no designations. A different person could come in and it could be very different. Broderick: I’m hoping. I’m hoping. Broderick: Yes. That’s the worst of it, you know, and then once this idea that you’re making immense—it wasn’t that it was the real estate, it was that it was immense. You didn’t build a building and make a good living out of it. You built a building and made a killing out of it. Broderick: I hope a couple of years of economic depravation and see a few developers—every bust cycle we see developers—whatever happened to what was that guy who was building all the East Side, his name began with an S, in the ’80s, he’s gone. [Ian Bruce] Eichner’s gone from the ’90s. Extell I would assume is in great trouble right there. There are a lot of these guys who go down because they go in too late in the market and they spend too much and they can’t carry their expenses. But after a few years of non success, of non-instant millionaire stories, the rationalization of making less but steadily may creep into the real estate community. I hope. Broderick: Because that was the idea. It’s the same thing with the people who built all those—the worst subprime properties, the Florida, Arizona and Las Vegas and California properties were properties that were built nowhere. The land was cheap but they were just built nowhere. There was no job for anybody to have and those were the ones that are abandoned now. Broderick: So, hopefully, with a little luck—they were going to make a killing those developers and some of them did, the banks and the mortgage holders are the people who ended up losing out not the actual developers. But, once the idea that you could make a million dollars over night becomes deflated maybe people will go back to just making a successful business. Broderick: I’ve talked way too much. Q: No, not at all. Most of my questions focus on sort of the mechanics of the Villard and the Coogan building, and how those situations played out. One question I want to ask is, I guess this is completely hypothetical, but what would you have liked to have seen happen with both of those sites, one or both of those sites? Broderick: It would have been difficult. With the Coogan Building, I could see it could go into an adaptive reuse. The problem was that Len Edel paid probably too much money to develop that site, but could that building have been left—as it was, it was a small site, he owned a lot of property beyond it and to the side of it—could that building have not been underground and couldn’t you have done something with glass so that the building could have been retained, it could have had some retail trade or something in there, and built under it, around it, above it, that sort of thing and then let him do the rest of it. The rest of his development was on unnotable property so that would have been fine. With the Villard houses, I think Philip Johnson made an impression on me. Although the issue of transfer of development rights is a tricky one, and one that the landmark community doesn’t like using because of potential for disaster, it strikes me that that was the only one and, you know, when you’re down to that level of quality and you’re down that only survive—when is there going to be a landmark battle that isn’t the last. It’s the only one. It’s the last. That’s what we always say, the last mansion. But, with something like that, I think with the Villard Houses we should have done transfer of development rights. There were plenty of sites nearby that could have—that should have been kind of left alone. Again, you could have gone under it, around it and behind it but not to replace it with that huge tower what is forty percent of the property or sixty percent of the property, I don’t know, it’s that huge building. So, how do you graft a tower like that on a low-rise building? It just looks ridiculous. Broderick: So, that’s always a fight. That was only two cases. In many cases, we’re dealing with somewhat banal buildings we’ve got a bigger problem. For instance, one case I didn’t even think of much until you talked about that was the Schinasi Mansion, the Chofetz Chaim. Did you all have that? That’s a big story. You all should have that that was a nasty one. It’s [unclear] somehow and it was mainly the tenants from the building below and the building on either side of it, it was a row house by [unclear], who we didn’t know much about before but did turn out to be important architects. It was one of what had been maybe thirty freestanding mansions on Riverside Drive and ironically enough all but two were demolished in the ’20s for the apartment houses that are there now. The two curiously enough were both from members of the Schinasi family, I don’t remember if they were built for the Schinasi’s, who were Turkish tobacco people and long gone. But there was a funny coincidence, one on 106th [Street] and Riverside and this one on Eighty-Eighth [Street] and Riverside. It belonged to a religious Jewish yeshiva school for a long period of time, it was in very bad shape, and they wanted to develop the property. There was a huge battle and it was a nasty battle because the building was in terrible condition and it wasn’t the Villard Houses, it wasn’t that important. It was important but it wasn’t that important and it was a huge landmark battle, it went on forever. Those people are—the people who did that are still around. Talked to Joan Roan [phonetic], a most notably a wonderful woman, they fought that and eventually it happened but it was very, very nasty. Short of St. Bart’s, the nastiness landmark battles I ever saw were St. Bart’s and Schinasi, where people just called each other names. It was gross. It was hideous. Schinasi, I was involved in that one and I went to the landmark hearings in the community and all the other things. By the way, one thing I haven’t mentioned, one of the techniques in the landmark hearings used to be that at a lull in the presentation between the two opposing sides, suddenly somebody would come in with a proclamation from the New York State’s useless historic preservation, and we know it’s useless, but it acted as an injection of life into the hearings again. They’d come down and say New York Preservation supports this, so they did that sort of thing. But I remember with the Schinasi mansion that it boiled down the yeshiva trying to talk about the miracles of Chofetz Chaim, which included among other things, it was very funny, he had received a letter that had a stamp on it, the stamp had not been canceled and so the temptation was to reuse it because it didn’t have a cancellation mark but it chose not to. So, it was a very funny hearing. Maybe that was the one with Carroll O’Connor. I’m trying to think who was there, minor celebrities. And of course the nastiness one was St. Bart’s where somebody I had worked with lied through his teeth. Do you have people talking about St. Bart’s? Broderick: That’s a big one and that’s where the Municipal Art Society in my opinion was incredibly culpable because they sided—they were one hundred percent working for that. There was another issue at the very time on the Upper West Side, a Methodist congregation with nobody fancy in it and they didn’t lift a finger, not a finger. Just as bad a battle, but it was all St. Bart’s. And that’s my gripe with the Municipal Art Society they were only, in the old days up until the new man, they were only interested in Jackie Kennedy’s world. It was only in Upper East Side, rich people. And the mess over St. Bart’s, I will never forget that hearing. Do you want to hear that story? Broderick: The question there was that this complex of church and community house, etc., built in 1916 and following through the early 1920s, had become by the 1980s the only area where you could still get light in the area of Park Avenue. It was Midtown, the tall buildings had surrounded it utterly. But it had a healthy life, it did a lot with young people, there was a young people’s singles club, they had a theater club, in fact, I think I taught once or twice in their singles club, they were active. They had a vendetta, we knew they had a vendetta, they had rich people who gave money to the church and every other church in the city like a St. Paul and St. Andrews, like a West Park, was jealous as all hell of St. Bart’s because the clergyman was able to live like a king. I think he had a limousine, they had a trip like some Park Avenue for the minister and they didn’t have to worry about raising any money to pay for a new light bulb, which made the other clergy very jealous. All of a sudden one morning he woke up and there was New York Times front page story saying that a man called—I’ll get his name in a second—an English developer who had a building collapse in Oxford—Robson [phonetic], came to the United States and he made a deal with St. Bart’s to build a huge tower on the site initially to demolish it, to build a huge tower on the site. That’s when I immediately came up with the idea if we take the landmarks, dig them up, and put them on top of towers and make a series of videos. Nobody thought it was funny. In any case, I was trying to make them laugh. That was immediate squawking so it became part of the site and it would have loomed over the church and gone up. Then followed a two-year battle, a really long battle, which pinned one half of St. Bart’s congregation against the other. St. Bart’s is a low Episcopal church, which means that it has a lot of conference so a lot of people who were of other faiths but became society members decided that they wanted to go to St. Bart’s because there wasn’t a lot of bells and smells so they were able to be comfortable if they were Jewish or if they were Presbyterian, Catholic even so it had a successful men. I think there were about eight hundred people, and split apart four hundred to four hundred. Four hundred agreed with the minister who was promised a TV and Evangelical show. He was very oily and very greasy this minister and very upper class and you were of the feeling that rather like Elizabeth Taylor that if you put a pin in his arm it would ooze gravy. But, he wanted to be on TV, Episcopal tele-evangelist, just before the Tammy [Tamara] Faye Bakker era, so that idea did eventually peter out. But he was going to do it with their religion, not some fundamentalist Christian stuff, it was going to be Episcopalian TV and so he was willing to undertake this. What they did is they came forward and announced that they had huge building maintenance issues. Well, all the ministers in New York, they’ve repaired everything there’s no building maintenance. They then came before the Landmark Commission, it was one of these half and half deals, and they said that they calculated that they had an endowment of X dollars but the repair of the roof, etc., would be double that therefore they had to—they suddenly produced cots that they put in the narthex of the church and they were going to house the homeless. That was about as serious to them—mind you, they had a community house so they did do some of this sort of thing but not in the narthex of the church. We got to the hearing and I sat myself back to watch the fireworks and the minister and the four hundred, half of the congregation who worked with him, sat in the front row and the other half of the congregation, many of them older ladies, retired, sat in the other half. The testimony began and they brought out Walker O. Cain who was an architect who owned what was left of McKim, Mead & White, that’s how I know him, and he testified about the—he is an architect, he gave them the estimate of all the costs, etc. This went on and on, back and forth with it getting nastier within the congregation, it’s really surgically cutting open people who have been friends and known each other for lifetimes. It finally got to the point where there was a young man shaking who came forward, scrawny little fellow, and I’m sitting with the old ladies from the church, and eavesdropping as madly as I could. He came forward and he announced himself as the treasurer of the church, treasurer of the congregation, and he was shaking. A woman told me that he had just got married and he was under a great of stress. He opened his mouth and said, “We’re lying to you. We have the money. We don’t have any problems. This is all a real estate deal.” At which point the minister, whose name I’ve forgotten, hissed at him, and I’ve never seen a minister hiss, and that was the end of the day. Broderick: Isn’t it incredible? It was ugly and in the end finally, they dropped the story but they only dropped it about three years ago, it went on for twenty-five years. Broderick: They didn’t touch it. The economic—fortunately each time they’d sort of get to a new stage the economic bubble would collapse so it survived. Broderick: So, it is as it was and it will stay, as it was I think now. Q: Yeah. I mean, you know in many cases, not all cases, but in certain circumstances, people are complaining of hardship or whatever you look at all these other factors, but to have that man come forward like that though. Broderick: Yeah. He spoke his conscience but it was really hard. Q: I wonder if he remained treasurer. Broderick: I don’t think so. I don’t think he ever went back to the building they were so brutal to him. Q: Yeah. Wow. Did you do any research on that building in that case or you were—? Broderick: No, I just adjudicated. I just went along with it. When you do these testimonies in most cases, you don’t do any new research unless it’s something you’ve been doing—work on anyway as in the Coogan Building with Professor Landau. Generally, you just try to pull it together and try to think of the significance. Q: Do you think the significance—increasingly, what do you think that people—if the great landmarks of great architectural style have sort of been designated, what do you think are significant arguments? Broderick: Well, there are lots of them, because of the history factor, I would even go what you’re saying [unclear] the neighborhood. I’d even go that far the retention in the neighborhood. Think about what—I guess you’d basically say well if this wasn’t here what would this mean. So, there’s lots you could still find. As I said about that testimony in Albany, it’s amazing to me that seventy-five people with the same groups came forward and all seventy-five people had a different take. People just have different takes and so I think that’s the important thing but it still boils down to politics. If there is enough letters—all it bottles down to is body count. How many letters go to Gale [A.] Brewer on that topic versus how many letters go to Scott [M.] Stringer, but it’s still all numbers. Broderick: The testimony means very little. It’s still just political pressure. Q: Yeah. Well, I think, you know, an important argument could be made about a lot of buildings that don’t end up being saved. So, if that’s true, then yes. Broderick: They just didn’t have an Arlene or an Andrew Berman or a Margot Gayle. It’s depressing. It is a very depressing topic. Q: Well, thank you. This has been great. Broderick: Thank you. If you need anything more I’m here.